My kids are looking forward to Halloween. They’ve been spending a lot of time looking through a costume catalog that came in the mail and informing us of what they’re going to be. As someone who earned the odd graduate degree in sociology, I find that I can’t quite turn off that portion of my brain that automatically analyzes any document that I come across as a cultural artifact. Fortunately there’s no racism any more or that might be offensive or something. It’s Two AM. Would You Open Your Door? It’s technically Sunday morning. Two A.M. I was working on a writing project (or, more accurately, had decided to stop working on my project since I intended to go to church in the morning). I decided not to bother to answer because I’m of the belief that no one I actually want to talk to would be knocking on the door at that time. That got repeated a lot. I saved my file, shut down my laptop, and pulled out my cell phone, deciding that if it went on for very long that I would call the police. I also turned off the kitchen and dining room light, leaving only the inside light by the front door on. The outside light on the front porch burned out and needs to be changed. I peered out our front windows trying to figure out what was going on. If they were trying to break in to our house they certainly weren’t doing it very efficiently. I heard occasional thumping noises but never any ripping of screens or shattering glass. Anyway, if you were going to break in to a house, why pick the only house on the block where the lights are obviously on? Whatever was going on outside sounded more like an argument than a break-in. Looking outside, I saw one guy standing on our lawn while another ran around a lot. Once he ran down our porch and ripped a small piece of wood off something in our neighbor’s lawn and ran toward our porch. It made very little sense in that I only saw two people but I thought I’d heard three voices. As I began to call 911, Kristen came downstairs. I stopped calling 911 as she started calling them from our land line. She explained what was happening, adding that she thought they were trying to break into our house. I said that I didn’t think they were and she handed the phone to me and I explained what I’d seen to the woman on the other end of the line. She said that they would send a car. We waited. No police car came. They wandered off. Ran, actually. First they ran up our neighbor’s driveway. Then they ran down the driveway of the house across the street from us. Then they went south on a street near us, came back and traveled west down the street directly in front of our house. Forty minutes later, there was still no sign of the Grand Rapids police. After they’d been gone for a while, I called the police department’s line for non-emergency assistance and asked what was going on. The person on the other end of the line said that they had sent out a patrol car and that it was on the scene, but that the scene had moved. Apparently other people had called to complain from other houses in the area and the police had followed the complaints down the street. Kristen and I decided to go to bed, guessing that it was over for the night. The next morning we surveyed the damage. The piece of wood from my neighbor’s lawn lay in front of our door. A number of Kristen’s flower pots had been turned over, broken, or dumped off the side of the porch. The hook on one of the hanging plants had blood on it. The grill on our screen door had been bent in and there were a couple small blood spatters on the door itself. I called the police non-emergency line to ask if I should clean up the mess or if they wanted to look at it for some reason. I was told that I could clean it up. At this point I decided that if this were a burglary, it was the least competent burglary ever in that rather than taking a knife and cutting through the screen door, these people had thrown our plants at the door and somehow managed to cut themselves on the pots. They had to be on drugs or something. Yet, it didn’t seem quite right. One of my neighbors called me today. He’d been out that night and came home at two in the morning to hear a fight going on on my front porch. He saw three kids at my house. One stood on my walk. One stood on my porch. The other was taunting the one on the porch, swinging his belt at the guy, throwing things, and cursing. The one on the lawn hung back and did nothing until one of the many thrown items hit the person on the porch. At that point, he tried to stop the guy with the belt. Beyond that, our neighbor also thought he saw a couple of the kids (he guessed they were high school or middle school aged) go into houses on our block. Interestingly, the neighbor in question was one of the other people who had called 911. At the time though, the operator had told him that they would send a car when they had one available. In one sense I can understand it. High school students fighting on a porch are probably not the worst crime going on in the city on a Saturday night/Sunday morning. Still, you’d think that the police would have more of a response than that. As for myself, I’m disappointed that I somehow failed to notice the kid being victimized on our porch. I know how it happened. There’s a big bush between the window I was looking out of and the porch, making it hard to see what was happening in the dark. Nonetheless, I wonder if I could have done something. I’d like to think I would have if I’d understood the situation better. Does Anyone Want a Rock? So I was driving to a client’s house late last week and I saw a rock. It is owned by the River City Excavation Company. River City Excavation sells mulch, rocks, dirt and presumably excavation. I happened to speak to someone who works there (my wife wanted me to find out how much mulch cost) and learned that the rock weighs 1300 pounds and would ordinarily cost $120. Nonetheless they are currently selling it for $82.99, dropping it by a dollar a day until it’s sold. I hear that they’re a little worried because while it is on the corner, the people in the cars that pass seem to be talking on their cell phones instead of noticing it. They’re considering placing a manikin in a bikini next to the rock (because there’s nothing that convinces you to buy rocks like a hot manikin…). Anyway, if you’re interested, they’re located on Hall just on the east side of 131. You know, they ought to be paying me for this. 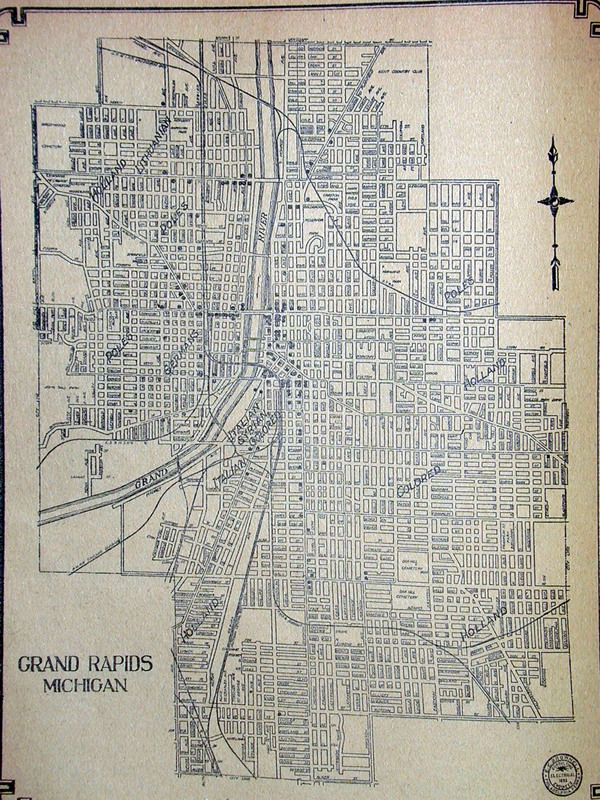 Take a look at the this old map of Grand Rapids. In addition to streetcar lines and a general sense of what Grand Rapids looked like early last century, you’ll find that each part of town has been labeled with the ethnicity of it’s residents. For more, take a look at the thread “Grand Rapids Then and Now.” If (like me) you’re looking at it as a guest, you’ll have to click on the pictures to look at them. Members get the pictures within the messages.